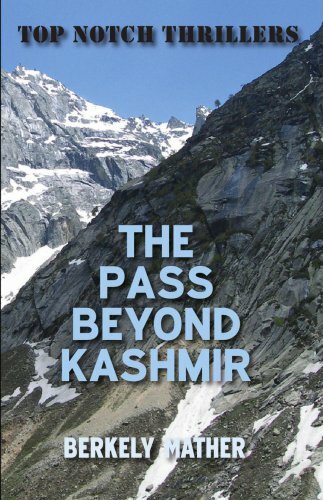 “You only get one or two thrillers a year – if you are lucky – as good as Berkely Mather’s 'The Pass Beyond Kashmir…. '.” was the verdict of Anthony Price in the Oxford Mail on the publication in 1960 of a thriller firmly in the British tradition of ‘ripping yarns’ by an author who, said the Glasgow Herald “beats A.E.W. Mason and John Buchan at their own game”. A delirious survivor from an ill-fated wartime surveying expedition to the foothills of Tibet raves… ‘Oil – all the oil in the world – on top of the bloody Himalayas!’ Years later, finding the papers of that expedition becomes a high priority for spies, mercenaries, oil companies and governments. Former army intelligence officer, unorthodox insurance assessor and freelance investigator Idwal Rees, an experienced Far Eastern hand operating out of Bombay gets involved in a dangerous game of hide and seek across India and Pakistan attempting to stay one step ahead of the opposition all the way to the pass beyond Kashmir…. where the invading Chinese army is lying in wait. By the time he published his second novel, The Pass Beyond Kashmir, ‘Berkely Mather’ (real name John Evan Weston-Davies) was already established as one of the 1950’s foremost writers of television (and radio) dramas for the BBC, including many crime series for which he was to receive a Special Merit award from the Crime Writers Association. Among the many famous fans of Kashmir was Ian Fleming who wrote: Takes the author triumphantly into the small category of those adventure writers who I, for one, will in future buy ‘sight unseen’. When the James Bond thriller 'Dr No' was being filmed, it was Ian Fleming who insisted on using Mather as a scriptwriter and Mather’s subsequent film credits included the historical blockbusters 'Genghis Khan' and 'The Long Ships'.